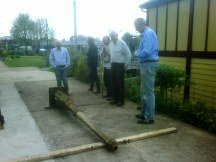 The final Open Day of 2010 also saw the setting up of pipework to take electrical cables round the site for path lighting and similar purposes. Here the pipe is tried out for size before being buried out of sight. Signal Box wins National Award! At the annual National Heritage Railway Awards the Preservation Trust was given the prestigious Invensys Rail Signalling Award (Structures) for the restoration of the box. We beat off fierce competition from Network Rail who had invested a great deal more money than us in two of their boxes, including the massive Seven Bridge Junction box at Shrewsbury. So a large feather in our cap, bearing in mind we are one of the youngest groups on the railway preservation scene. 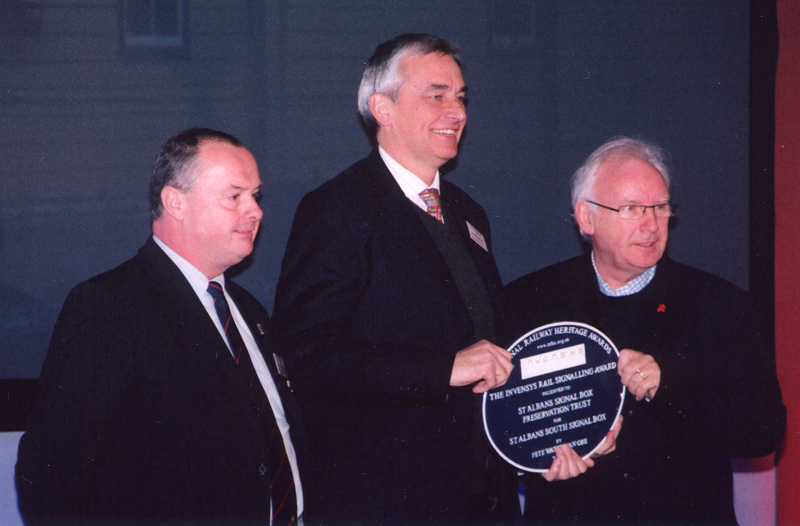 The picture is of Keith Webster, our Chairman, being presented with the award by Pete Waterman OBE (on the right) and Mr Duggan from Invensys Rail. 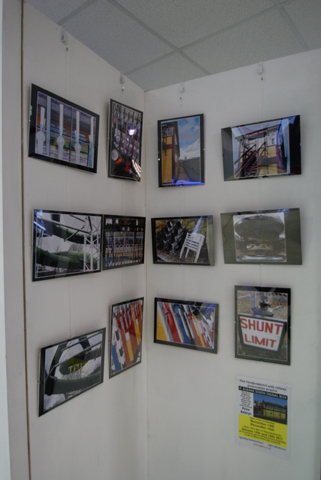 An exhibition was put on in the Foyer at St Albans City station of photos taken by St Albans residents. About a third of the pictures had been taken at the signal box so we were invited to the opening (by the Deputy Mayor) and four of our Trustees attended, all dressed in our new 'uniform' sweat-shirts. The picture shows the signal box photos and a few others. 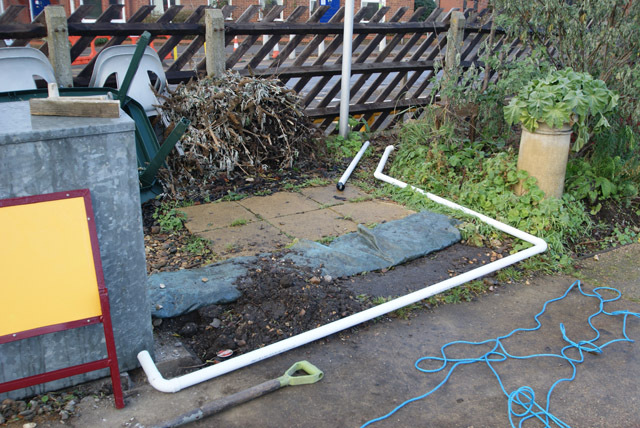 The lamp post seen coming onto site in May (see below) was, after careful cleaning and repainting, 'planted' in the garden with the aid of a car engine hoist. 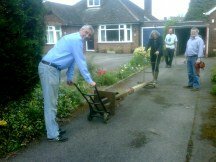 Work has started on setting up a demonstration of colour light signals in part of the garden not currently used for much. 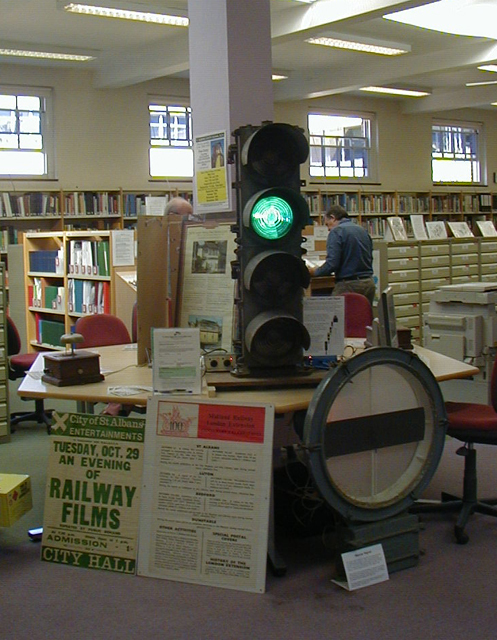 The signals were donated by Network Rail and the 'Feather' (junction indicator) by Mr Scroggins - our thanks to them! 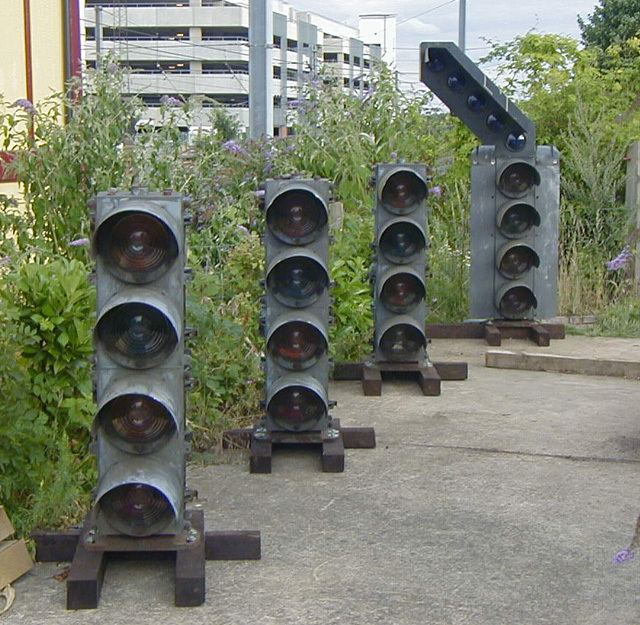 Although only around 30 years old, these signals, fitted with filament bulbs, are now historic, as new signalling installations use LED (Light Emitting Diode) technology. Our first attendance at an outside exhibition. As a member of the Hertfordshire Museums Group, we were invited to attend a "Retro-Fifties/Sixties" exhibition at the Hertfordshire County Archives in County Hall. We met up with some three hundred people, virtually none of whom had heard of us! The picture shows one side of the display. 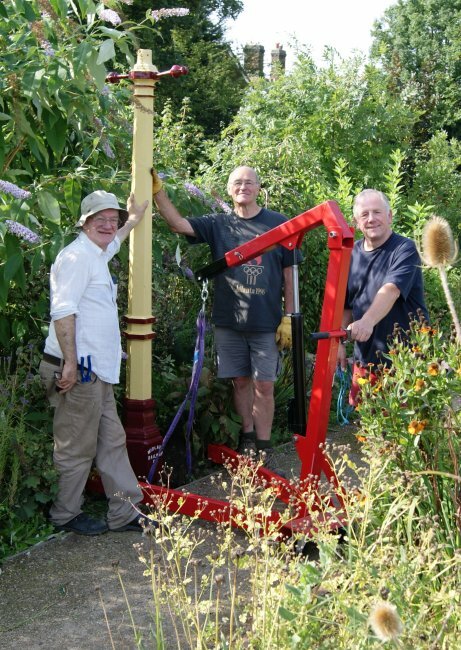 A generous benefactor has donated on long term loan a Midland Railway lamp post, and an old cast iron ground signal. So we had some fun picking them up and transporting them to the box. They weighed a ton - literally! Many thanks to all those that gave their time and strength to the removal. It snowed and most trains were delayed or cancelled. Our intrepid photographer waited (for some time!) 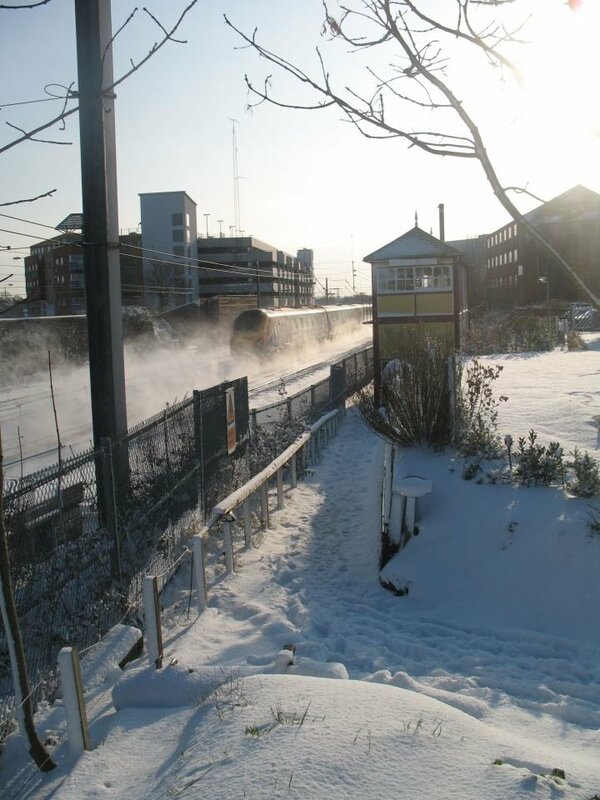 and was rewarded with swirling snow as a fast train went past.